Free trial periods are an excellent way to build trust with new potential customers and boost conversion rates. 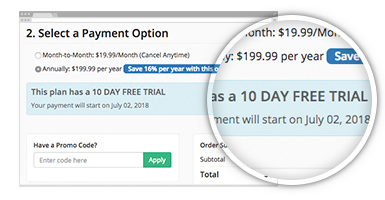 The Free Trial Period add-on allows you to define a number of free trial days for each paid membership plan. Credit card info is collected upon signup and if the user does not cancel then they will automatically be charged after the free trial period ends. Regardless of your industry, the try-before-you-buy sales method simply works. AOL used free trials to attract early Internet users in the late ’90s; the Wall Street Journal now offers free trials to increase the number of subscribers for the online version of its flagship newspaper; Netflix offers a one month free trial… the list goes on. Free trial periods are effective because they give potential customers a glimpse of what they are about to buy. Crafting the perfect landing page or blog post is important to get people interested in what you are offering. But by also providing a free trial you allow users to experience your product/service first-hand.